« Anyone need me in Berlin late June/early July? Yep that’s “Laxmi” from Sita Sings the Blues. Cotton fabric, polyester batting, polyester thread. 52″ wide by 72″ high – twice as big as any of my 4 Elements panels. I might sew some shiny gold sequin things coming out of Her open hand to symbolize the gold coins that are often shown pouring out of it. I again used my “Trapplique” technique, combining trapunto and applique by quilting pieces first, then applying them to the background with a satin stitch. It makes a nice sculptural bas-relief effect. Notice the hanging sleeve at the top, and the signature tag I accidentally sewed on sideways. Oops, right? Whatever, it still works. …it folds up like this. What a sewing nerd I’ve turned into. 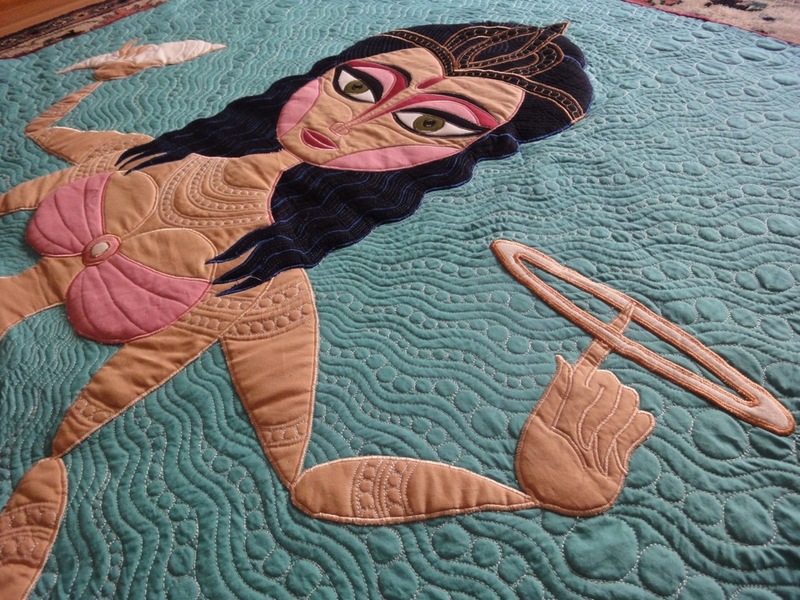 Anyway, I’m guessing nobody can afford to buy the “Laxmi” quilt since it took almost 200 hours to make, and at a reasonable hourly rate we shudder to estimate the price tag. 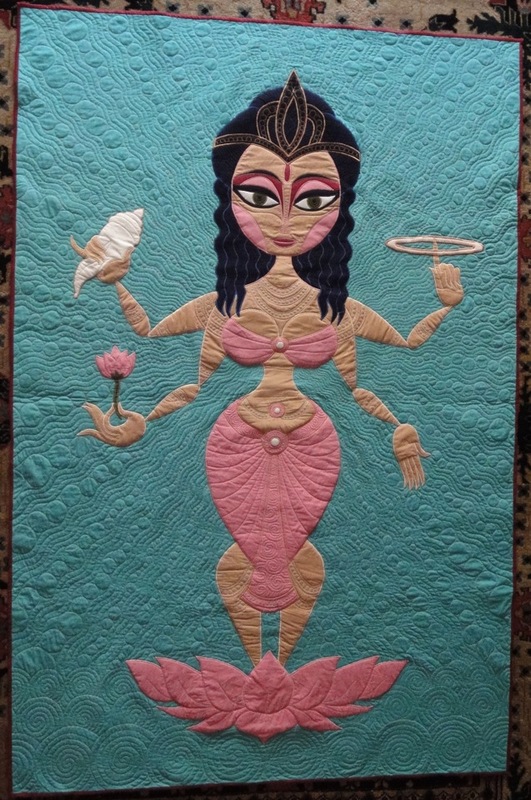 But unlike most quilts you can get a cloisonne pin or necklace of the same design for much much less, because we just happen to have said merch for Sita Sings the Blues. I’d love to own one of these, but there’s no way I could afford a fair payment for the hours and love you put into this piece. Amazing work, as always! Absolutely beautiful. Love the signature patch too! 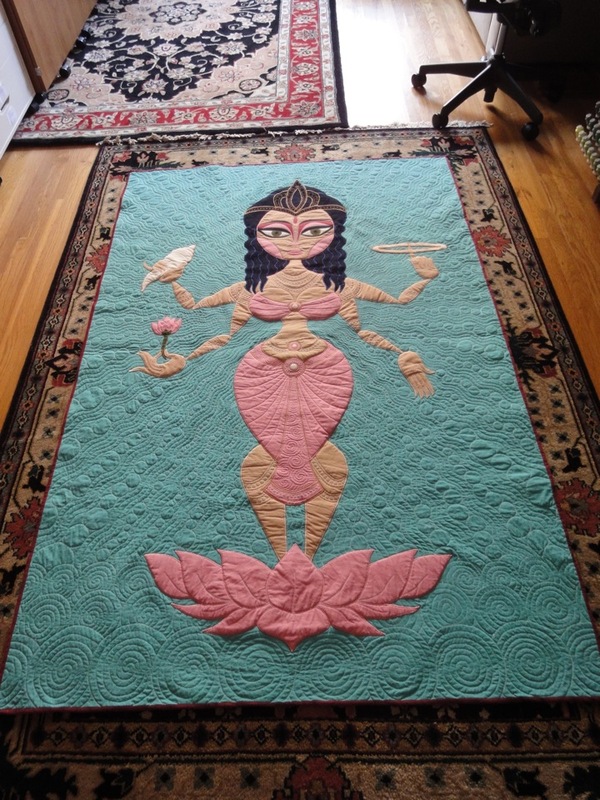 Your Laxmi quilt is gorgeous! I loved Sita Sings the Blues. Parijat Desai shared it with us. We happen to be her parents. Your work and your words about property and art have been so my teacher these past two years. 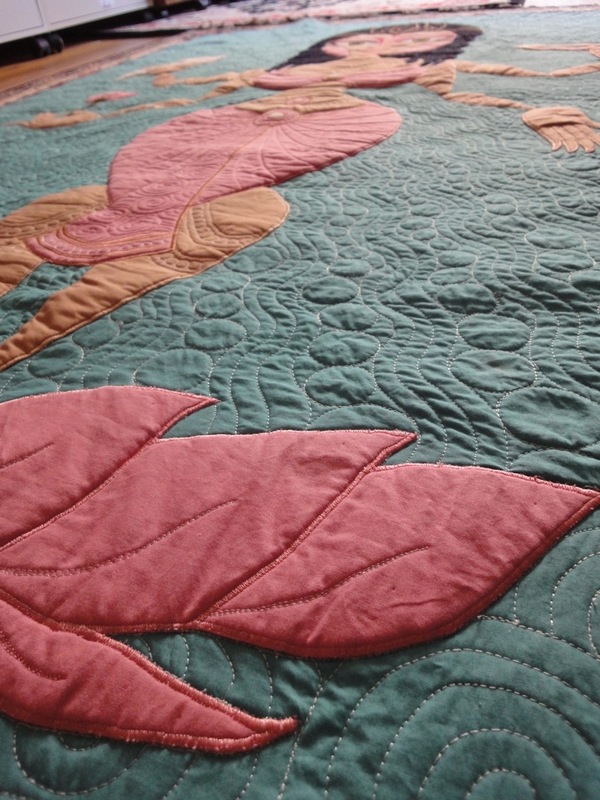 The last quilt already made me gasp, the one with just form and no color; this is so beautiful. Beyond amazing. Congratulations on the fantastic results of all the hard work. Don’t know if you remember me, I used to live in Trina’s lower flat with Tom. I followed a link from Leanne Franson on the Facebook to this page. 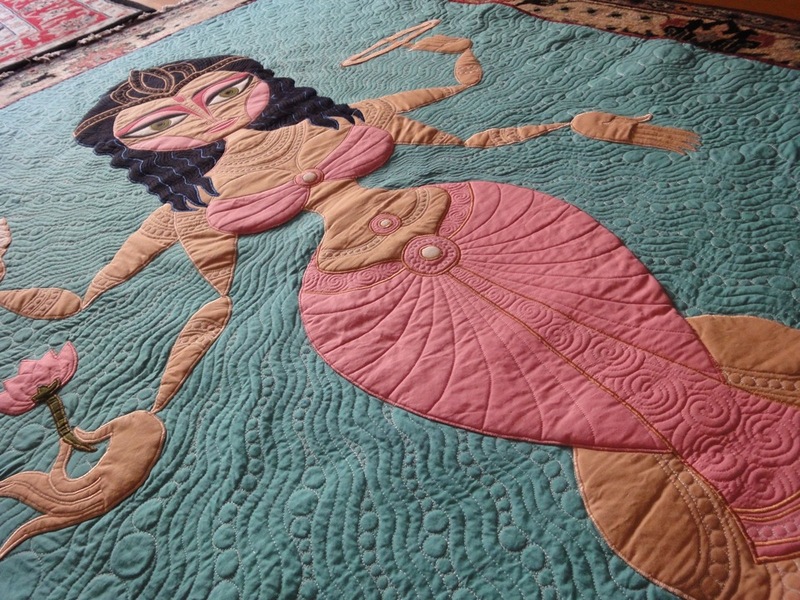 Your quilt is amazing and I’m in awe that you did this in only 2 weeks. Your technique brings a sculptural aspect to it. The background quilting really makes the piece work beautifully. I adored the movie, which showed up inexplicably on public access cable one morning here in Portland. It was a great story and had my favorite kind of music. Ah, the padding in her luscious lotus blossoms! Just gorgeous! 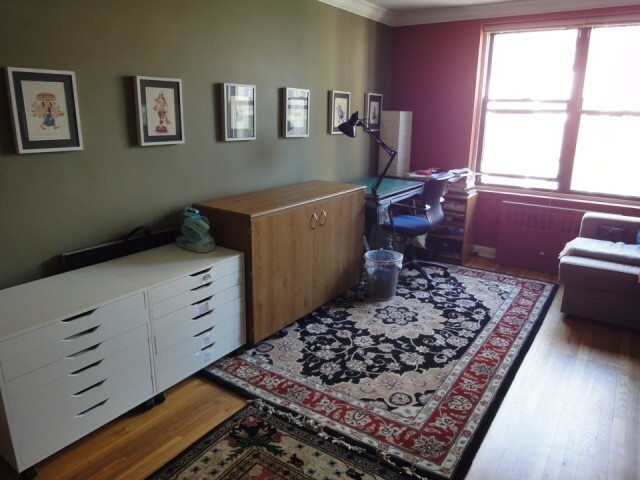 I can’t believe you finished this in 2 weeks! 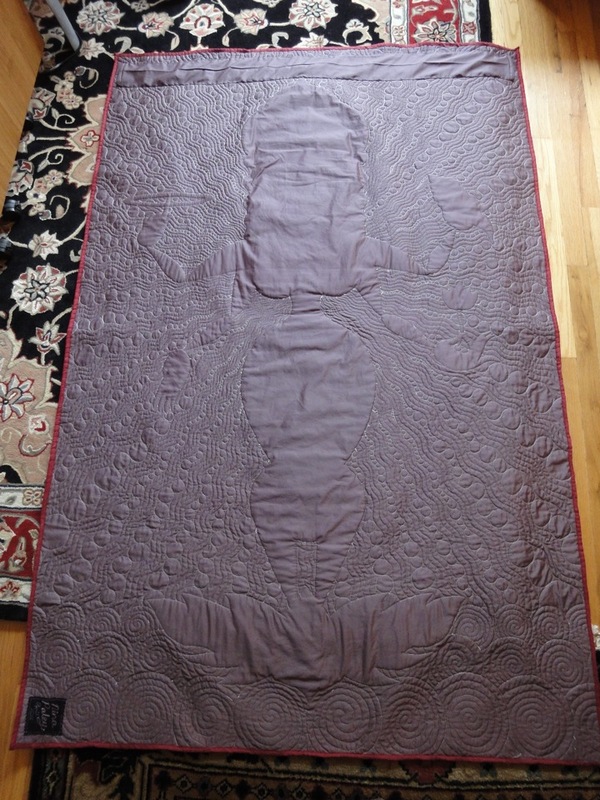 I’m so jealous, I don’t think I’ve ever finished a quilt that quickly! 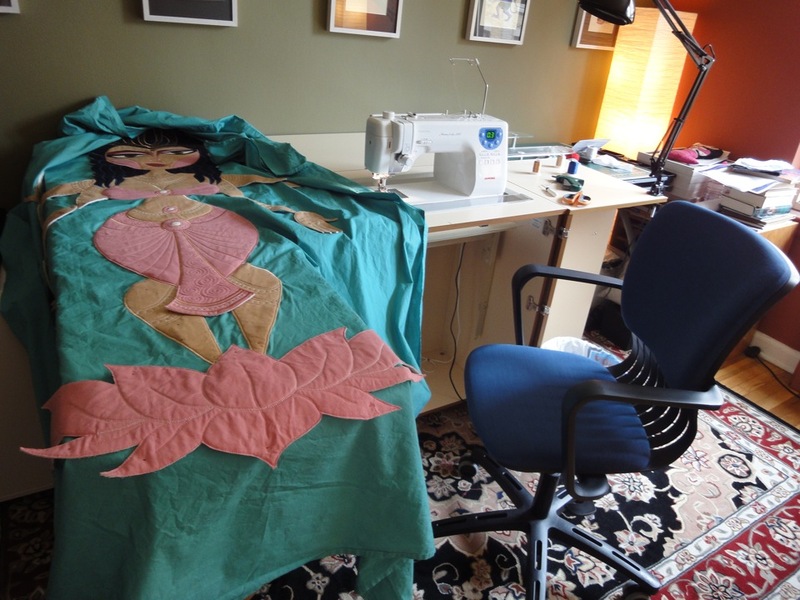 The advantage to living alone and having an obsessive personality combined with few obligations, is one can finish a quilt in less than 20 days (and an animated feature in 3 years). Many people would prefer to have relationships and stuff, but it works for me! Hi Nina! What a lovely piece. I had always wanted to own a quilt that I could frame up in my house. Do u happen to have some old piece lying about in your attic that you dont mind parting with…..for a fee please? If not, I might print some pinups with the photos….. I have been in Utah worshiping mountains and away from the blog and the emails…..oh this is so sensual, spirited, and the perfect color choices. Once again rollicking proof of a master artist with all her consciousness at work. Bravo! I don’t know if you remember me. I invited you to my website which you visited; and I sent you a copy of my CD. I want this SOOOOOOOO bad! 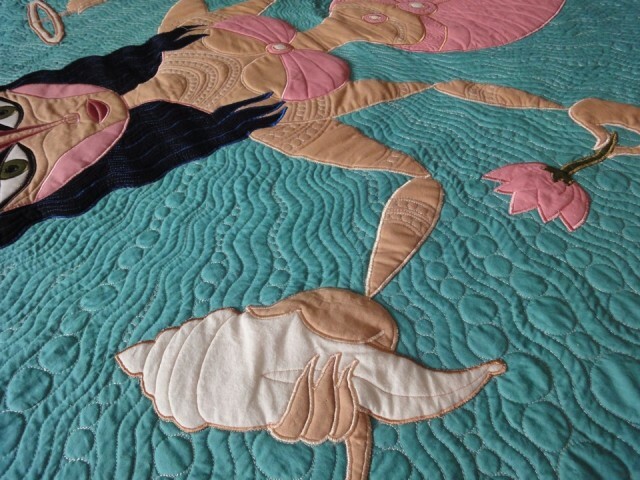 It is the most adorable and beautiful quilt EVER!